Savanna Barry, the Florida Sea Grant agent with UF/IFAS Extension for the Nature Coast, is leading the initiative to teach the importance of seagrass in the Nature Coast counties. Just off Cedar Key in the Gulf of Mexico lies a portion of the Big Bend Seagrasses Aquatic Preserve, the second largest aquatic seagrass preserve in North America. To keep it healthy, Barry is educating boaters about the impact of propeller scarring on seagrass. She says once seagrass is lost to poor boating practices such as prop scarring and grounding, Florida loses a resource vital to its economy. So what makes these underwater lawns more important than the one in your front yard? Seagrasses provide homes and nurseries to more than 70 percent of commercial and recreational fish species. They also provide food for sea turtles and thousands of other marine life, increase water clarity and improve general water quality, Barry said. All these elements build a healthy coastal environment, which in turn attracts residents and tourists, boosting the state’s economy. o Using navigation channels or deeper water while on plane. o Angling, or trimming up the engine when boating over seagrass beds. o Powering off the engine if the boater runs aground. Trim up the motor, then push or pole the boat to safe depth. Not only can adopting these practices protect seagrass, but they can save boaters money, Barry adds. Along the Nature Coast region, for instance, if a boat runs aground the owner can expect to pay at least $225 per hour for towing. To refloat a grounded vessel, businesses charge about $20 per foot of vessel. Those charges don’t include the fines a boater will pay for violating state and federal laws in place to protect seagrass beds. Damaging aquatic seagrass preserves carries a penalty of up to $1000. 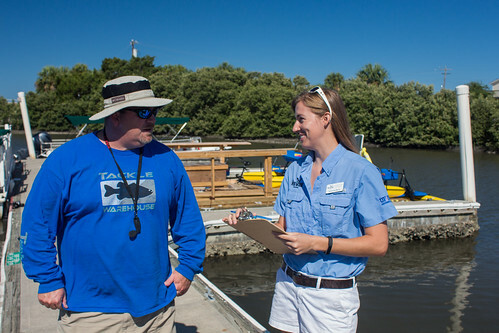 So that she can develop more effective educational programs, Barry is asking boaters in her area to participate in a brief voluntary survey that will help her gauge boater habits and seagrass knowledge. The survey takes less than five minutes to complete. Barry’s passion for coastal protection and stewardship stems from her childhood growing up in Virginia on the Chesapeake Bay. She carried out her passion studying seagrass during her Ph.D. work at the University of Florida, earning the name “Seagrass Savanna” from classmates. She knew she would one day teach Floridians how vital the coasts are and why they need to be protected.